Get lost in classics like James and the Giant Peach to contemporary favorites like The Hunger Games. Steven King once said, "Books are uniquely portable magic." This poster (King quote included) will inspire young readers to take on 100 of the most beloved. Grab a coin and scratch them off as you go, from classics like James and the Giant Peach to contemporary favorites like The Hunger Games. The colorful images revealed will chronicle them all in a visual story. Made in the UK, where the worlds of Mary Poppins and Harry Potter came to life. Great idea to promote reading! Giving this (with the literary insults attached to the back) to my nephew, who is just starting to get excited about reading! Great present for a book lover. Quick delivery. Good quality! My co-worker loves to read. I went back and forth on whether this was a Great gift idea or not. 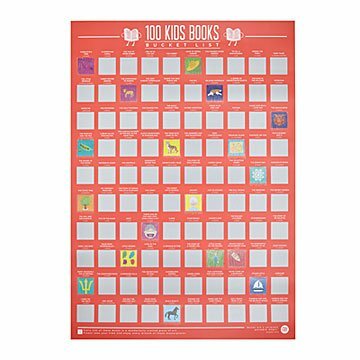 I ordered it and when I gave it to her, she was So excited to scratch off books that she had read and order books that she hadn't read/scratched off yet! Her siblings want one! So Glad I went with my gut. This is an Excellent gift for a book lover- and their family. Wonderful poster! I gave this to my daughter for Christmas. She is already a big reader, but this encourages her even more to read because she wants to be able to scratch books off the list! I got two of these this holiday season for friends with new babies. The families are avid readers and love books, so the poster is perfect for them and something they can use for years to come. I'm buying another for myself! This was such a unique gift to include in a Yankee swap for my family. We are all book lovers and when I saw it I was secretly hoping I would end up with my own gift. It was such a hit at the swap, traded multiple times because everyone wanted it. The perfect gift for your reader! I bought this as a Christmas gift for my daughter the avid reader. She loved it. This is a very unique and thoughtful gift. My book-loving friend loved this. He was ready to scratch off the books he already had read and head to a bookstore to start the rest of the list!